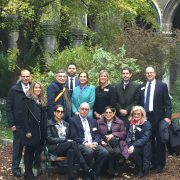 Once again, the Jewish Welcome Service (JWS) hosted a delegation of the American Jewish Committee (AJC) from November 6 to 12. 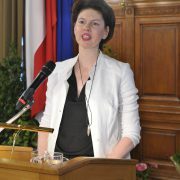 The JWS organized a varied program in cooperation with AJC NY and the Austrian Consulate General. The aim of the visit was to give an impression of present-day Austria – from politics to business and culture to modern Jewish life. 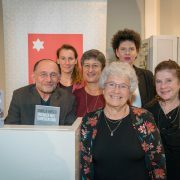 Ruth Elkabets and Miriam Prager from Israel visited Vienna a few years ago at the invitation of the Jewish Welcome Service. They brought the diary of her great aunt Camilla Hirsch, in which she meticulously described the everyday life and the conditions at the Theresienstadt concentration camp. Thanks to the Mandelbaum publishing house, this diary has now been published and presented at the Jewish Museum Vienna in mid November. 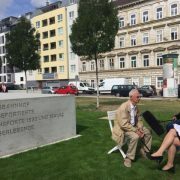 Two sites commemorating the Jews from Vienna who were murdered by the Nazis were opened in Vienna this fall: the Aspang train station memorial and the Herminengasse memorial. 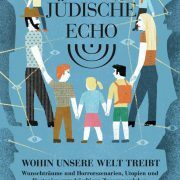 Where our world is going – the focus of the current issue of “Das Jüdische Echo” (Vol. 66/2017). The magazine traces ideals for living together in society, religion and culture, in another area of tension between horror scenarios and great dreams. On June 21 at Vienna City Hall, Municipal Councilor Marcus Schober presented this year’s Leon Zelman Prize for Dialogue and Understanding to the Viennese initiative Shalom Alaikum, which helps refugees, on behalf of City Councilor for Culture Andreas Mailath-Pokorny. The first prize is endowed with 5,000 euros and donated by the City of Vienna. 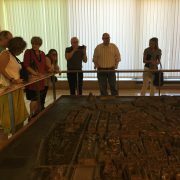 From May 16 to 22, at the invitation of the Jewish Welcome Service in cooperation with the foreign service, a group from the Neuberger Holocaust Education Centre in Toronto visited Vienna to learn about the debate over the Holocaust and about modern Jewish life in the city.